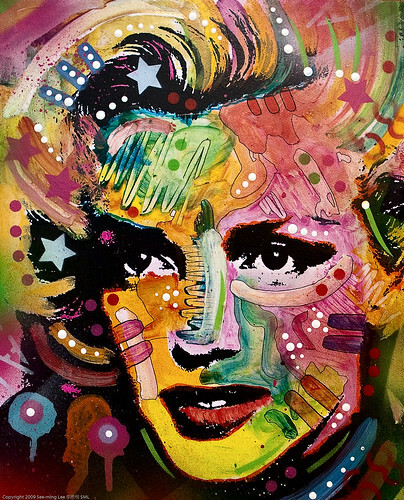 Dean Russo (Etsy / Facebook / SML Flickr / Twitter) is an American pop-artist based in Brooklyn. I paid his studio a visit during the 13th Annual DUMBO Art Under the Bridge Festival in NYC in 2009. Here are some photographs and interview videos shot that day. 1. Process + Methodology. 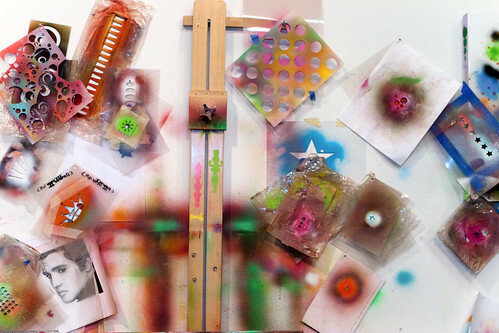 Dean Russo chats with See-ming Lee (SML) and Mac Farr (MMF) about the process and methodology in creating his mixed media paintings. The artist also mentioned interesting aspects of how the economy fundamentally changes the way he works. 2. Subject Matters. 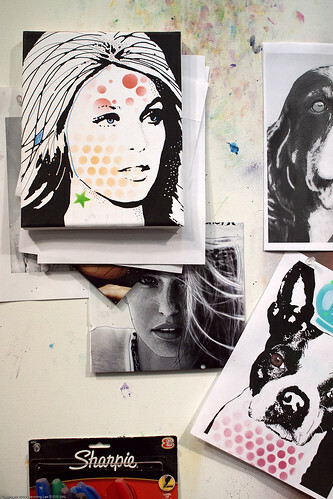 Dean Russo talks about how he picks his subject matters for his mixed media paintings. 3. Source of Inspiration. Dean Russo chats with Mac Farr about where he gets his inspiration — graffiti in Brooklyn apparently! 4. Artist Toolbox. Touring Dean Russo's artist studio was an interesting experience, as I haven't really met any pop artists in person before. 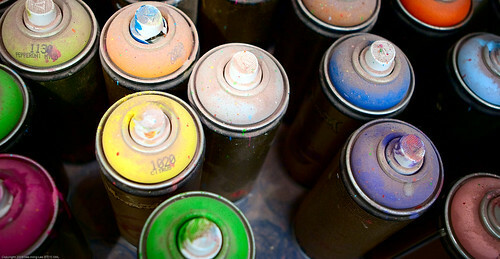 Here we find many interesting tools not commonly found in an artist toolbox: stencils, spray paints, etc. 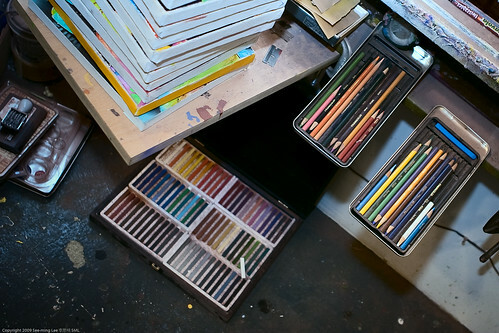 It's quite a wonder to see, but there are also the familiar tools like color pencils and pastels. 5. Process. Most people like to see the end result, but I prefer seeing the process. I believe that process is an important part, without it you cannot have the result. During our interview, Dean told me about his entire process in creating his mixed media paintings, as long as I don't record it nor write it down. As such, I cannot really write about it either but all I can say is that I find it very interesting — that an artist workflow is not far from that from designers (my primary profession). 6. 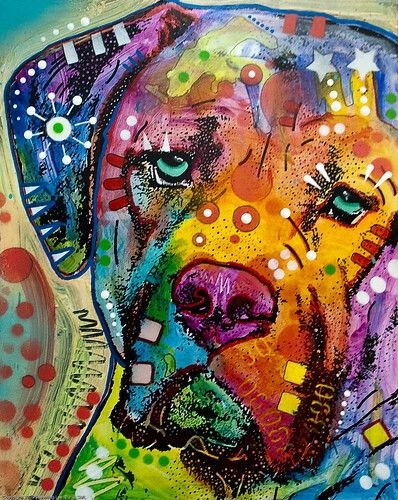 Dean Russo's mixed media paintings include many iconic public figures, but interestingly also many cats and dogs — many of which are commissioned work. You can purchase his paintings at his Etsy site. 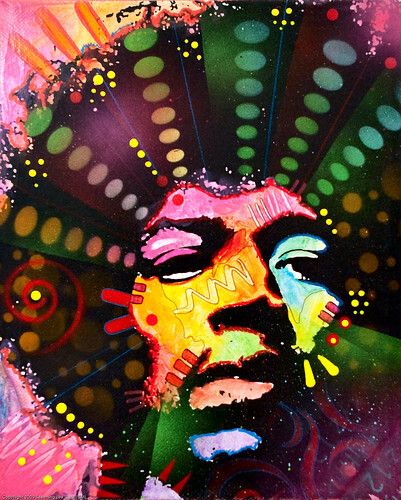 Most items are priced around $69 depending on their sizes, which is quite a bargain for original artwork — it's not uncommon to find fine art prints asking for more than that these days so 1/1 editions at that price is a great deal!